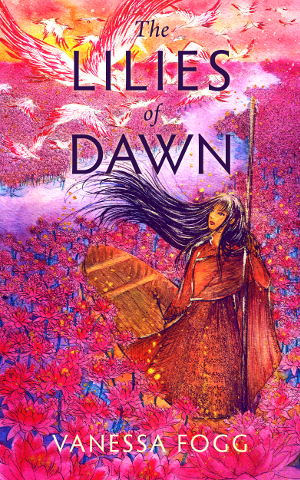 The Lilies of Dawn, a lushly written, lyrical fairy tale of love, duty, family, and one young woman’s coming of age, will be out July 27, and is now available for pre-order. Like all of our books, this title will be DRM-free, so you can buy from any retailer and load the book on any ereader. A paperback version will also be available for $7.99. This fantasy novelette tells the story of a lake of water lilies that glow with the color of dawn. For generations Kai’s people have harvested these lilies, dependent upon them for the precious medicines they provide. But now a flock of enchanted cranes has come to steal and poison the harvest. The lilies are dying. Kai’s people are in peril. A mysterious young man from the city thinks he might have a solution. Kai must work with him to solve the mystery of the cranes, and it will take all her courage, love, strength, and wisdom to do what she must to save both the lilies and her people.